Brother sewing machines are very popular to the users worldwide. Brother XL2600I Sew Advance Sew Affordable 25-Stitch Free-Arm Sewing Machine is not an exception. It is very easy to understand and best sewing machine for the money. Another great point to get this sewing machine is its price. It is very low priced though it is full of features. You can get almost every features of a computerized sewing machine in this machine although it is not a full featured computerized sewing machine. It has so many features integrated, so you can read brother xl2600i review. How to use brother sewing machine? Where can i buy a sewing machine ? All the stitches have multiple function. Pressure feet can be changed easily. Built in light for sewing in dark. Sewing machines can come in handy in our day to day life by so many means. But, this sewing machine is built specially intended for the beginner. Because, it is very budget friendly, you can get this sewing machine under 100 bucks. But, seeing this low price, don’t think that it is not a good performer. Instead of that there are so many features integrated to this sewing machine and undoubtedly you can call it a workhorse. Even you can use it as a portable sewing machine because of its size and weight. So, if you want a sewing machine with so many features and having a user friendly system but within a very affordable budget, then Brother XL2600i would be very beneficial for you and your family. Connect one end of your power + foot pedal cord to the power jack of your machine. Switch ON the sewing machine by switching the button to ‘I’. Place the thread bundle on the spool pin. Take the bobbin and place your bobbin on the bobbin winder. Pull a little bit of thread from the thread bundle on the spool pin, take and wrap it around the thread winder. Place the other end of the thread inside one of the bobbin holes. Pull it to extend the thread to hold on to the thread by using your fingers. Turn on your sewing machine and start moving the hand wheel. The bobbin should be started to load. You can easily do it by following the illustration of the machine’s body, as it offers automatic needle threading system it is very easy to do. For more detailed information please, read the instruction manual for you convenience. Brother XL26001 Sew Advance is one of the top selling sewing machines on Amazon. It comes with 25 amazing stitches that are built-in. It is well suited for every day sewing projects and craft projects. An excellent beginners’ machine, it has a free sewing arm. For convenient of the users the accessory storage is created in the free arm of the sewing machine. This machine also has 5 presser feet with a needle threader, upper-drop-in bobbin system along with 1 easy step- button holer. It is equipped with auto bobbin winding and a thread trimmer to help the novice sewing enthusiasts. It provides a nice work station as it has a light bulb for the working light. Brother XL26001 Sew Advance is made for beginners and novice sewing lovers. It is a compact machine that is quite reasonably priced. It has all the basic 25 built-in stitches and some good automatic features such as threader and bobbin winder which can help a starter to work on his or her sewing and craft projects with ease. 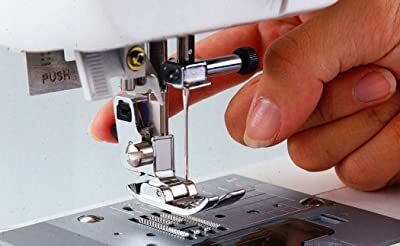 We highly recommend Brother XL26001 Sew Advance to any beginners as it can be easily operated and worked with. Brother XL26001 Sew Advance can be bought on Amazon however; it can only be bought by buyers from those countries that support 120V AC. Installing Brother XL26001 Sew Advance is a breeze. Users are required to follow the manual that comes in two languages (English and Spanish). We should take care of our sewing machine regularly, other than that the sewing machine will not give expected performance. Here are some tips, you can take a look. Always disconnect your Brother XL2600i from wall socket while not using. Use the specific needles for each specific work. Cover it with any hard/soft cover to protect it from dirt. Disconnect the machine from wall socket before doing any adjustments to the machine. Clean the hook area regularly. Never use anything like heater, oven or any other hot objects near it. Never put anything on the openings of your Brother XL2600i. Do not block any openings with anything too. Clean the feed dogs area every week at least. Never put anything on the foot pedal. Never drop the foot pedal hardly. Make adjustments to your Brother XL2600i by reading the manual. Never spray any inflammable chemicals near your Brother XL2600I. Keep it safe from direct sunlight. Brother XL26001 Sew Advance comes with a manufacturer’s warranty for 1 year. Buyers can register their machine online with registermybrother.com. The instructional manual advises users to avoid using oil to maintain the machine. Users are required to refer section 6 in the user manual on how to keep the machine dust free. As it is a fairly cheap sewing machine user need to be careful while cleaning it. Brother xl2600i manual is a perfect sewing machine for the beginners. Whether you are using it for mending your clothes or designing your favorite dresses with your creativity, it can be very advantageous to you. From any normal sewing work to the advanced level of sewing it can serve you to a great extent. So if you are a beginner at sewing and can’t wait to start sewing then this sewing machine is the perfect one for you. It doesn’t have complexity to operate so it is very easy to cope up with its style. In a word, this sewing machine is the best one if you want a budget friendly but feature good sewing machine.